As we celebrate Earth Day this year we are reminded of the diligence required to affect change. Today the environment continues to be attacked and the clock is being turned back on progress on many fronts. Ansel Adams spent decades in the battle to protect our environment. At his core, his activism was driven by his love of the environment and his humanity. The tumultuous 1968 Democratic National Convention included a visit from Ansel. Ever the outspoken environmentalist, Ansel gave a presentation to the DNC Platform Committee. His remarks, reprinted here , were prescient and are unfortunately more apt today than 50 years ago. The message he presented was a foretelling of the climate crisis we face today. 1968 was also a year of cultural upheavals in the US. The VietNam war was raging as well as a dramatic anti-war movement which spilled onto the streets of Chicago that summer. It was also a time that the modern day environmental movement was growing. By the spring of 1970 the first Earth Day was celebrated and 20 million Americans took to the streets in coast to coast rallies. Looking at Adams’ early commitment to environmental activism (starting in the 30s) we are reminded of the ongoing work required to preserve and protect our wilderness. Adams was an unremitting activist for the cause of wilderness and the environment. 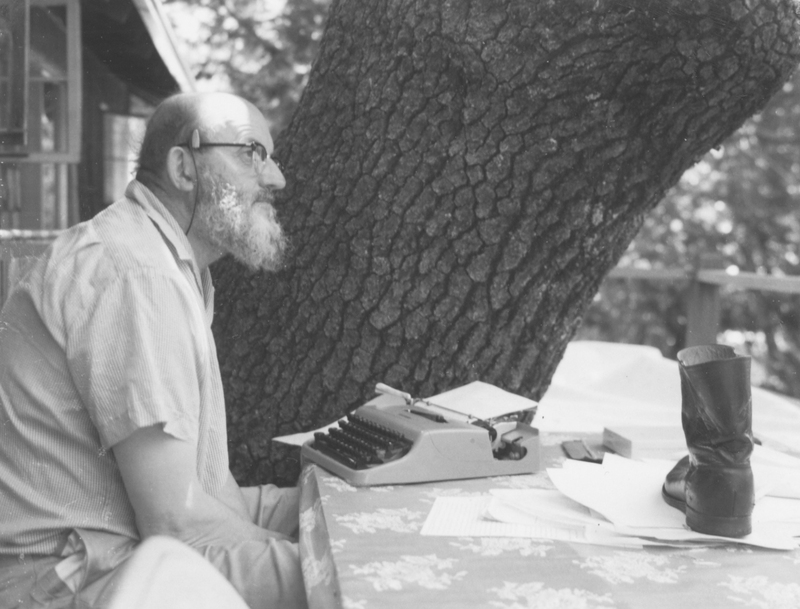 Over the years he attended innumerable meetings and wrote thousands of letters in support of his conservation philosophy to newspaper editors, Sierra Club and Wilderness Society colleagues, government bureaucrats, and politicians. Collectors have found the gallery’s “Modern Replicas” a welcome addition to the options for collecting the work of Ansel Adams. The prints’ quality is on par with the contemporary photographs using the latest printing techniques. For the collection, the gallery have chosen prints from the collections of the Ansel Adams family and the Ansel Adams Archive at the Center for Creative Photography at the University of Arizona. Now the gallery is introducing a print of the majestic image “Mt. McKinley, Wonder Lake” taken in Denali National Park, Alaska in 1947. The photo of Mount McKinley with Wonder Lake in the foreground was taken in the summer while Adams was in Alaska on a Guggenheim Fellowship trip. It was one of the rare cloudless days of that summer in Alaska. Adams and his son Michael spent a week in the ranger station waiting for the right conditions. The image was ultimately captured with his trusty 8×10 camera at 1:30 in the morning. The print is available in sizes from 8×10” to 40×50” printed on heavy paper that mimics the look and feel of gelatin silver paper. It is shipped dry mounted to an acid-free foam core backer. The 8-ply overmats are museum quality acid-free rag board, also hinge mounted to the backer. The prints are also available framed in both Valley Wood or Matte Black. To find out more about the print and owning Mt. McKinley, Wonder Lake as a Modern Replica Print . In 1919, when Adams made this photograph, he was 17 years old and experimenting with photography. He was most likely still using the Box Brownie his father gave him in Yosemite in 1916. The standard “art” photography of the day was in the Pictorialist style, an effort to diffuse the natural sharpness of the lens and film and more closely resemble traditional landscape painting. This is one of the very few pieces of the early pictorialist style that Ansel printed later in life, the most well known being the Grove of Tamarack [sic, actually Lodgepole Pines], also known as the Lyell Fork of the Merced from 1921. Muir Woods would have been a relatively difficult day’s journey, crossing the mouth of the San Francisco Bay by ferry and traveling the next 20 miles of winding dirt road by car, bus, horse, or bicycle. Quite an excursion if the sole purpose was to experiment with the camera. 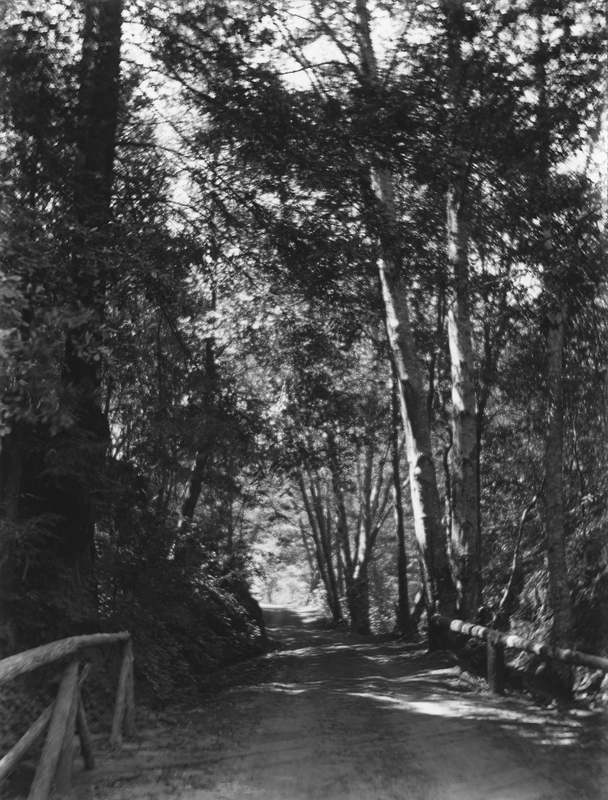 The Adams family has within its collection several pieces of Path, Muir Woods, including a vintage bromoil print that Ansel inscribed to his mother. This is a late print from the family collection, by descent to Anne Helms. It is, obviously, atypical of what Adams was known for, but is an early example of his creativity and natural awareness of composition to achieve a finished work. “Portrait of Musician (Domenico Brecia)” Born in 1866, Brescia studied music in the Milan and Bologna conservatories. He left Italy to arrive in Chile in 1892 as choir director of an opera company. After a change of government in Chile in 1911, he settled in San Francisco, where he became professor of composition at Mills College, a position he held until his death in 1939. Brescia is the author of four operas, two symphonies and many shorter works, especially chamber music. He was a longtime member of the Bohemian Club, composing music for two Grove plays. Specializing in landscapes in a muted palette, scholars consider Piazzoni among the “Tonalists”. He sought out the lighting effects of certain times of day, taking a “special interest in full moonrises, the viewing of which became a family ritual. Venturing up a hill, the family would cheer the appearance of the moon. Piazzoni knew the exact time for each moonrise and kept precise records.” This, the fact that Gottardo was a highly respected member of the Northern California Artists, along with his gentle personality, may have influenced Ansel Adams respect for Gottardo. 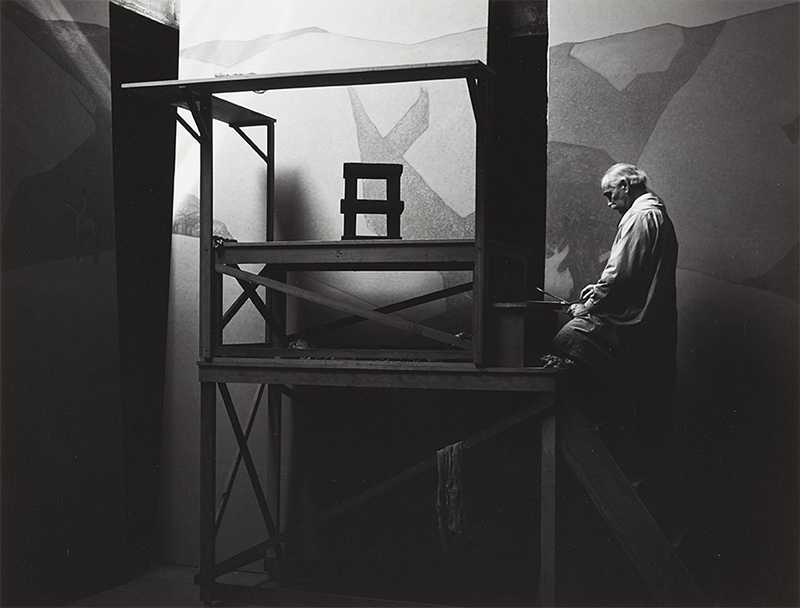 His best known murals are on permanent exhibition in San Francisco’s de Young Museum and it is thought that he might have been an influence in encouraging Ansel to print in larger, mural formats. It is no wonder Ansel chose this image to be part of his Portfolio Six edition. “Ruins of Old Church,Taos” Taos Pueblo, a collaboration between a young Ansel Adams and feminist writer and bohemian Mary Austin, was published in 1930 in a small edition of 108 copies. Limited and hard to find, it is considered one of the greatest books produced by San Francisco’s renowned Grabhorn Press. The project was exceptional for its time – not only the intersection of two careers, photographer and writer, but of the American environmental movement and a movement by white women to promote Pueblo arts. Always an innovator, this lovely print from the 1970’s illustrates how Ansel was experimenting with modern papers to see if he could replicate the look and feel of the original Dassonville sensitized paper used in the Taos project. Although not one of the 108 prints that were bound for the book, “Ruins of Old Church, Taos” is the Plate 4 image. Exceedingly rare, this photograph comes to us from Anne Adams Helms collection and is the only exemplar we’ve seen outside of the published edition. 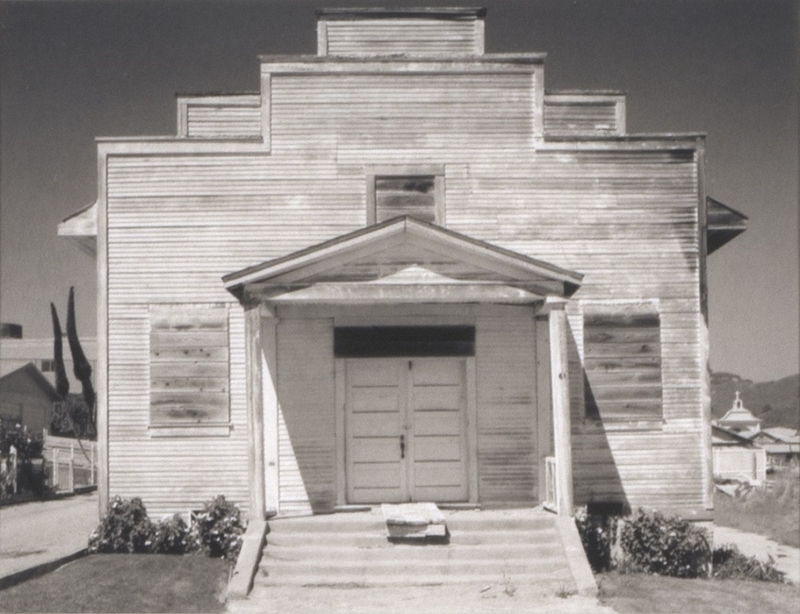 “Meeting House, Davenport”, c.1970, Polaroid, 3.5 x 4.5 inches (center) St. Vincent De Paul Church, in Davenport, was built in 1914 entirely of cement from the local Santa Cruz Portland Cement Company, which had been established in 1906. 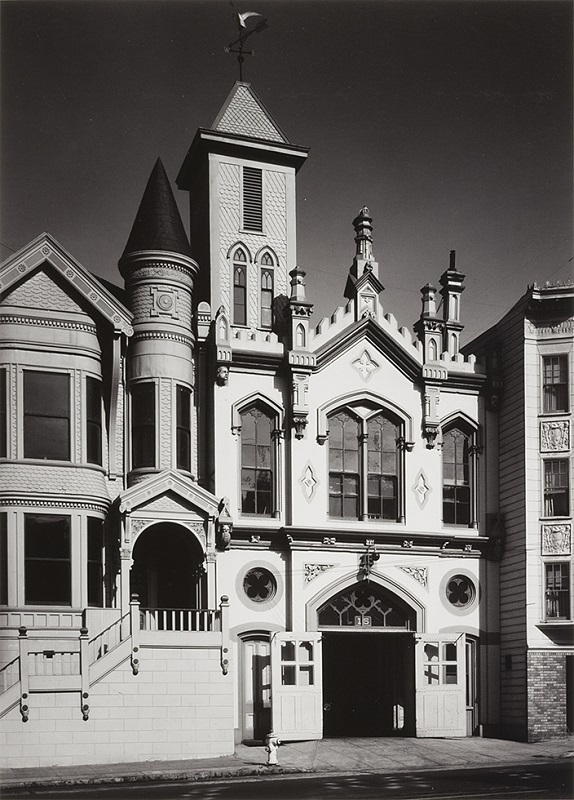 Ansel Adams made the church famous when he took the photograph above with a Polaroid camera in the 1970s. There’s a world of difference between the contemplative process of using a view camera and the instant result of a Polaroid camera. 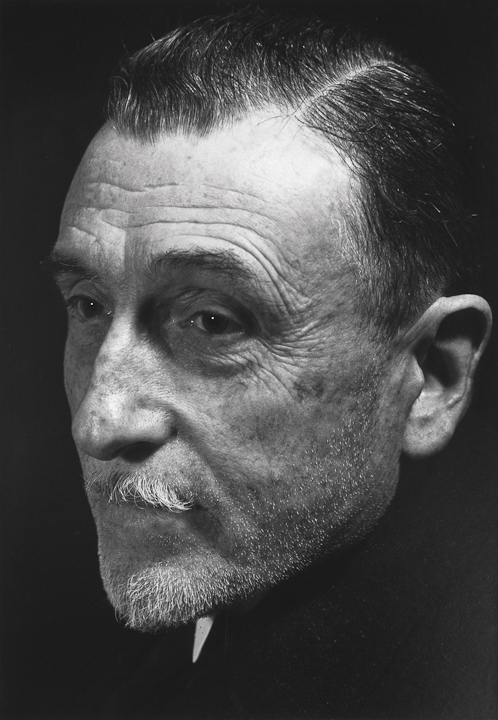 Edwin Land and Ansel Adams met in 1947 at an optics convention, and once Adams saw what Polaroid cameras could do, he immediately became a consultant. Adams was still testing films and cameras for the company up until his death in 1984. “There it was, (a Polaroid image) brown and of rather awful quality. But, by gosh, it was a one-minute picture! And that excited me to no end,” Adams said. The success of Adams’ collaboration with Dr. Land laid the groundwork for Polaroid’s later sponsorship of younger artists such as Andy Warhol and Robert Rauschenberg. 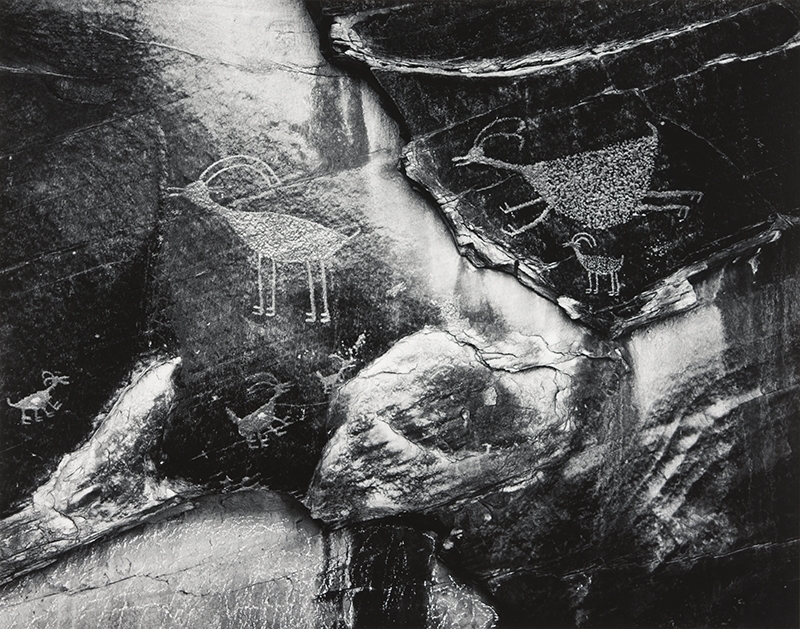 “Petroglyphs Monument Valley”: This famous petroglyph depicting Bighorn Sheep was captured by Ansel Adams in 1958, located at Monument Valley, Arizona. Found in all parts of the globe except Antarctica, many petroglyphs are dated to approximately the Neolithic and late Upper Paleolithic boundary, about 10,000 to 12,000 years ago, if not earlier. Although there are many Anasazi Petroglyphs in Monument Valley, the ones photographed by Ansel are thought to be some 700 years old. The running Bighorn sheep are particularly striking and can be seen in a niche below the Eye of the Sun, another historic rock formation. Monument Valley is a Tribal Park owned and managed by the Navajo Nation. This is a superb example by Ansel Adams, printed in a glossy 16×20 inch format and in “Excellent” condition. 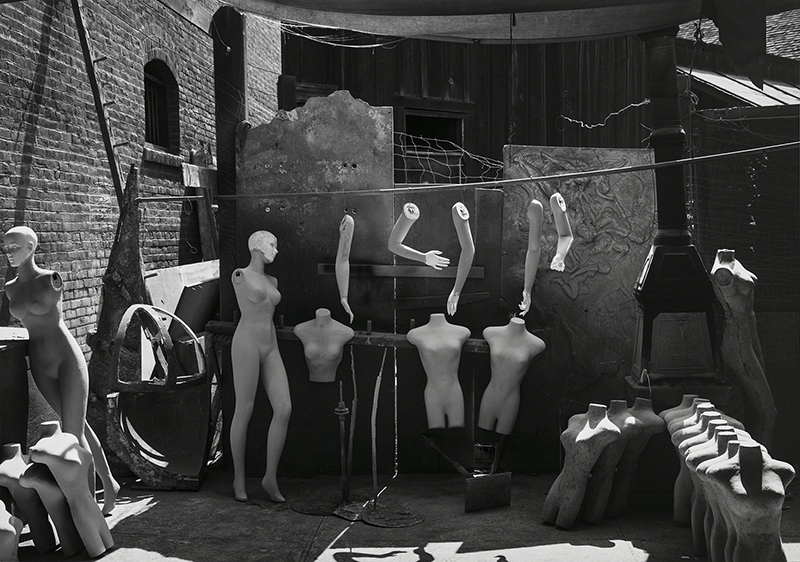 “Mannequins, Movie Lot”: This gelatin silver photograph, printed in a large glossy 16×20 inch format, is signed and in “Pristine” condition: it is an extremely rare example. The image has an interesting reference to film-noir and cinematography during the early 1940’s, and was likely taken in one of the Studio City movie lots when Adams was working with the University of California school system, namely at UCLA.